SPLICEDwire | "Capote" movie review (2005) "Capote" review, Bennett Miller, Philip Seymour Hoffman, Catherine Keener, Chris Cooper, Clifton Collins Jr.
"Capote" is another in a long string of well-made, well-acted biopics whose subjects are creative thinkers, but which offer no insight into the creative process. Focused on the few years in the early 1960s that innovative author Truman Capote spent visiting Holcomb, Kansas, to delve into a quadruple murder -- and befriending one of the suspects for his landmark book "In Cold Blood" -- the film stars Philip Seymour Hoffman in a virtuoso performance that captures the writer's upper-crusty, effeminate mannerisms and squeaky lisp without turning him into a caricature. But if you're looking to understand Capote's gift -- to understand his writing and identify his talent -- you won't find that kind of character exploration here. The closest this film gets to edifying how Capote came to personalize and novelize his investigative journalism -- thus breaking entirely new literary ground -- are a few shots of the author sitting at his typewriter, followed by phone calls in which his publisher and friends tells him the manuscript is "brilliant!" and "astonishing!" 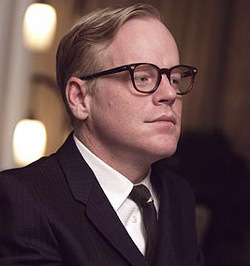 As a character piece, the film is a knockout, thanks to Hoffman's embodiment of Capote's celebrated idiosyncrasies, be they physical (the way he holds a cocktail glass or newspaper as if they were tea cups at a finishing school), vocal (uppity but outgoing), social (he delights in holding court at Upper West Side parties), or psychological (behind it all, there's sublimated damaged goods, selfishness and insecurity). "Capote" is, in fact, not a particularly flattering portrait of the writer, and director Bennett Miller does not shy away from questions about the writer's motives in his friendship with, and manipulation of, killer Perry Smith (hollow-featured Clifton Collins Jr. from "Traffic" and "Mindhunters"). The film is as elusive about its answers as Capote was himself, and that works well for the story (as does the simple, sparse but iconic cinematography that brings vividly to life both New York society and Kansas winters). But Miller and actor-turned-screenwriter Dan Futterman ("The Birdcage," "Shooting Fish") are also elusive about what drew Capote to this small-town crime in general and about what drew him to Smith in particular, which does the film a disservice. Chances are "Capote" will not disappoint anyone already predisposed to see it. But while the film spins an enlightening yarn about Truman Capote the man, it provides little illumination into what makes him worthy of a movie about his life. The cast also includes Catherine Keener as Harper Lee, author of "To Kill a Mockingbird" and Capote's dearest friend, and Chris Cooper as the dubious local sheriff eventually won over by Capote's odd charm.